Average, I like the instagrat Infinity better. Schließe mich an - average Radiopop. ▒ Een standaard ø plaatje uit oktober 2015 van: "One Direction" (alias: "1D"), een jongens formatie uit Engeland en Ierland, bestaande uit: "Niall Horan, Liam Payne, Harry Styles en Louis Tomlinson" !!! Voornamelijk bestemd voor de verliefde tieners ☺!!! Von 2.5 abgerundet. Die Raps machens nicht besser. Der Saft ist raus - das Resultat klingt entsprechend klanglos - mehr als eine 3 liegt leider nicht mehr drin. Vrij standaard boybandplaatje met een hoop clichés. Slecht is het niet maar warm loop ik er ook niet van. Pleasant enough, but special in no way. Really like this one and it isn't immature like some of their past tracks. 13th UK top 10. 21 weeks in the UK top 100. Brazil#67 of year end 2015. 2 weeks top 10. World Chart#3. 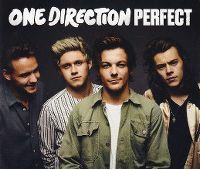 The biggest selling boyband single of 2016 in the US. Das ist für mich Marktforschungs-Pop in Reinkultur. Schmerzfrei anhörbar, aber auch überaus offensichtlich darauf getrimmt, bloß niemandem weh zu tun. Kommt reichlich kalt und beliebig daher. With this song, it sounds like the band decided to stop evolving their sound at 'Four', then turn around and go back the other way to 'Midnight Memories' and even 'Take Me Home'. 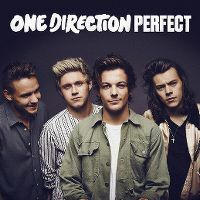 The exit of former band member Zayn Malik has certainly taken away some dimension from their aesthetic, but with 'Perfect', it sounds like they're just getting on with things rather than opting to do anything spectacularly different. Understandably so, though, being their last studio album before their hiatus as a group. Still, it would be nice to hear a bit more grit and/or proper emotion so they can go out with a bang. Unteres Mittelfeld, wie fast immer. Ach den kann man doch hören. Eigentlich ein ganz nett, schön dahin treibender Popsong, der sich soundmäßig/auch stimmlich gut anhört. Zieht sich aber etwas, da die Struktur ein Spur zu simple ist. Der Mittelteil holt da auch nicht viel raus. 4* kann man schon geben. When I first heard this, I was horrified, and that opinion hasn't changed in the countless times I've heard it since. This is a very alarming regression for them after recently making probably their best song, "Drag Me Down". It is a move back to the childish rubbish they were making a couple of albums ago, especially the first verse with all the "knight in shining amour" and "taking you home to mother" imagery. Also, saying to someone "I'm perfect for you" just sounds wrong. But, of course, because it is the boys from One Direction saying it, it is the most romantic thing ever. It also sounds very musically similar to Taylor Swift's "Style", one of the most boring and dull songs of the year, so that really isn't doing this song any favours either. Gefällt mir weniger diese Nummer. Gut erträglich im Radio, im Auto, im Warenhaus. Ansonsten nicht die Musik meiner Wahl. Tja, was soll ich dazu sagen ist so eine Langweilerband wie Reamonn oder Sunrise Avenue und macht genauso langweilige Musik, die man hören kann aber eigentlich nichts besonderes ist! Schade, dass viele hier nur die Boyband hören. Eine tolle Komposition, die für mich gar nicht nach Boyband klingt und alles gehabt hätte für einen richtigen AC-Hit - und ja, auch mich erinnert er etwas an "Style". Gute 5. One of their better songs. Naturally, more mature than many of their releases from a few years before. I thought this would have peaked better in many of the international charts. This would be my 1D guilty pleasure and as the title suggests it's PERFECT! Topped my personal chart for one week. Came in at #89 on my TOP 100 OF 2015. Der übliche BoyBand-Schmus - die Interpreten austauschbar, die Musik sowieso.